Beyond the empty lot that served as my childhood fief there lay a long, narrow park known as the Greenbelt. Many cities boast such parks now, but back in the early 1970’s it was a cutting-edge idea. 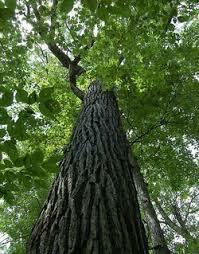 One day my brother Tim dared me to climb a majestic tree in the Greenbelt. The tree’s canopy spread out over an impressive circumference; it was the tallest tree in the park. The first four vertical meters of the tree were trunk, and into it some intrepid soul had thoughtfully hammered large nails at regular intervals, creating a kind of rudimentary ladder. High up in the branches of this tree there was a platform, a piece of plywood fixed in a crook of branches with two-by-fours. Tim dared me to climb to the platform, and I did, with alacrity. I was a skinny seven-year-old spider monkey. I reached the platform and crowed about my win, but reversing the trip up the tree was a separate proposition. My sweaty palms slipped on the bumpy bark, my feet reached blindly below me to find the next foothold, the slim shaft of a nail. Reconstructing this memory, I think a nail either broke or slipped out of the tree, but a more plausible explanation is that I miscalculated entirely and redistributed my weight into thin air. The fall took place in a heartbeat, a fraction of a second. I was feeling for the nail with my sneaker, then I was sitting on the ground under the tree. My brother says I was smiling. All the other kids were staring at me, and some of them started to cry. When I looked down at my unbroken body there were two disconcerting things. Blood was blossoming across my thin t-shirt, and I wasn’t wearing anything between this bloody shirt and my shoes. Tim told me later that my shorts and underwear were hanging from a nail, way up the trunk of the tree. I can see those yellow cotton shorts, that cheap white pair of underwear, fluttering like ignoble flags. I rode my bicycle home half naked. My mother heard my screams from far away, and she stood at the front door, braced for an emergency. By now I was soaked with my own blood. My mother drew me a hip bath and made me get in it. We were both in shock. Splashing the wound clean revealed that it was in fact just a bad scrape, my mother said. I still have the scar. It extends from below my left breast to the same latitude as belly button. I wore a piece of gauze taped to my abdomen for a week or so. The scar was the visible mark of the fall, and there was also an unseen repercussion. The fall was when the fear began. After the fall, I was outside of nature. I wasn’t a little spider monkey, free to roam my North American jungle, but a human, who could fail to step on the stupid nail that some other fallible, ignorant human had hammered into a previously pristine, perfect tree. It was misstep, and it happened in the blink of an eye, like the lapse of judgement in the real, physical world that has separated us from nature, apart from the breathing cells of everything besides ourselves.